One great thing about being a SOBO: you can stop looking back – nobody ever walks up behind you. When I woke to my tent aglow in the morning sun I was hopeful that the weather had cleared. I packed gingerly in my treed retreat and then I sat reading and worrying that the 7:00 a.m. sun reflected off the placid lake below might give me a sunburn. 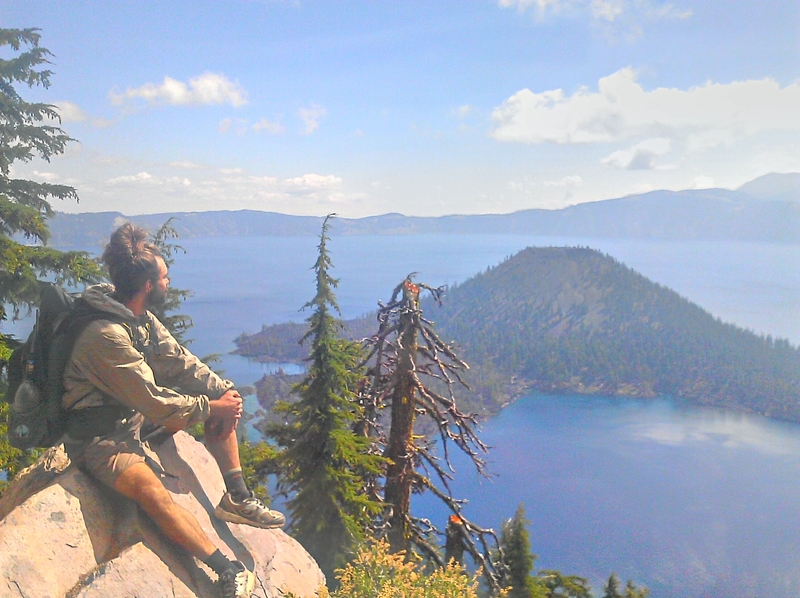 Today is an easy day: 13 miles around the Crater Lake rim and down to Mazama Village, resupply, then stay in the campground there. That said, I still have to get moving – it’s six miles via the Rim Trail to the nearest water, and all I have is a liter left over from the gallon I gleaned off some Seattle RV’ers yesterday. Around that time, as I basked in the temporary ownership of my own flat expanse of concrete, a gentleman pulled up in a sporty new car and asked if I was a PCT hiker. When I answered yes he went to his trunk and withdrew a carbon fiber bear canister, carefully unlocked it with a nickel, and withdrew a handful of “bars” for me. Something called “Epic” and made from bison meat, which I ate with my oatmeal, and another one which I’m eating now that resembles an overgrown cream wafer but with more protein than a bar made from ground bison. It is delicious if only because it is different, delectable because I had forgotten what it was like to eat something that is not smashed or melted. The hike was easy and led to several beautiful viewpoints. The fog burned off early in the afternoon and I relaxed on the patio at the rim village making lunch and watching day hikers continue south along the rim and up a gnarly knife edge to a nearby peak. I found Mazama Village smoldering, the inhabitants wide eyed and horrified at the carnage wreaked upon them by the northbound herd that was still there pillaging the villages meager stores.